^ Chris Landea. 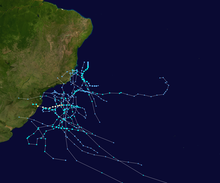 FAQ: Why doesn't the South Atlantic Ocean experience tropical cyclones?. NOAA. July 13, 2005 [May 14, 2009]. ^ College of Earth and Mineral Sciences. Upper-level lows. Pennsylvania State University. 2004 [2009-05-14]. （原始内容存档于2016-03-03）. ^ 存档副本 (PDF). [2013-08-30]. （原始内容 (PDF)存档于2013-02-20）. ^ Aviva J. Braun. Subtropical Storms in the South Atlantic Basin and their Correlation with Australian East-Coast Cyclones (PDF). American Meteorological Society. 2008 [November 19, 2010].